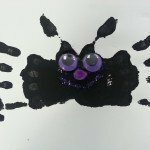 So it’s your babies first Halloween and you want to remember it in a special way, try these two crafts below. I ejoyed making them with my baby girl. Now I will always have something to remember her first Halloween. *When your finished put your craft in a frame. Save them, Take them out every Halloween to enjoy them for years to come. Step 1: Paint the bottom of your baby’s foot with a light coating of paint. Too much paint with make it messy and take a long time to dry. Stamp your baby’s foot on the black construction paper. Step 2: Let dry, When footprint is dry use a marker to draw mouth and eyes (the heel of the foot is the head of the ghost). If you want instead of drawing eyes with a marker use googly eyes (found at any craft store). 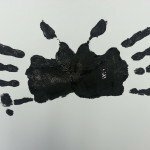 Step 1: Paint one of your baby’s hands with a light coating of black non-toxic washable paint. Holding the paper long ways stamp your baby’s hand on the paper. Step 2: Paint your baby’s other hand turn the paper upside down so the previous handprint is on the bottom of the page. Stamp your baby’s hand on the paper to it is touching the palm of the first hand print. Step 1: Paint the heel of your child’s foot white. the middle orange and the top and toes yellow. I used three paint brushes so I could quickly dip each one in the paint to paint her foot. 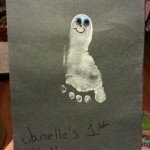 Step 2: Press your child’s foot (toes up) onto the top part of the canvas. 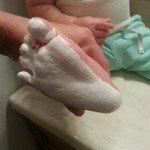 For quick clean up, wipe your child’s foot with a baby wipe. Step 3: Repeat step one and two with the other foot. Step 4: Turn canvas around so the feet are at the bottom and the heals of the foot are facing up. 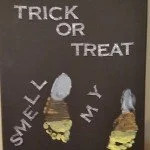 Step 5: Using the scrapbook letter stickers or paint pen write Trick or Treat Smell My Feet! You’re all done! Enjoy for years to come.